Youth Grow provides hands-on education in school gardens to help all children feel accepted and empowered to make healthy choices, become stewards of the environment, share their culture and increase community resiliency. Teach garden-based lessons at Title 1 schools that integrate science and other core subjects with outdoor education. Provide afterschool and summer garden education for children in schools and communities that experience high food insecurity in partnership with Schools Uniting Neighborhoods (SUN). Facilitate intercultural and intergenerational community building through events and workshops in the garden. Build the leadership of each school community to make garden programs more sustainable in the long term. Harvest produce to donate to the school cafeteria, school-based food pantries and families. Act as leader in the garden education field by providing training opportunities, doing research and convening practitioners. To apply for a school partnership, please contact our Youth Grow Program Manager at amoreena@growing-gardens.org. Youth Grow takes on new commitments as funding allows and seeks opportunities for joint fundraising. Kelly Elementary (SE), Glenfair Elementary (NE), Davis Elementary (SE), Cherry Park (SE), Powell Butte Elementary (SE), Lent K-8 (SE), Scott K-8 (NE), Whitman Elementary (SE), Faubion K-8 (NE). “Healthy Habits Take Root” showcases the PPS Nutrition Services Farm to School Program in action at Lent Elementary. Students experience hands-on garden lessons, farm field trips and Harvest of the Month cafeteria promotions through partnerships with Growing Gardens, Zenger Farm and the Oregon State University Extension SNAP-Ed Program. 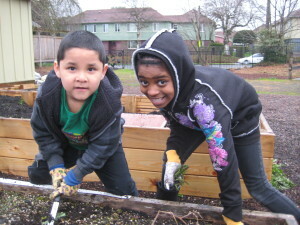 Watch the Gardening in Schools segment on AM Northwest KATU News featuring Youth Grow!